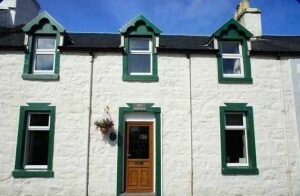 Fully modernised traditional cottage situated in a quiet street in the upper village of Tobermory, overlooking the bay and minutes from the Main Street. Luxuriously furnished and equipped, with a beautiful secluded sunny garden to the rear and spectacular views of the Sound of Mull & the mountains of Morvern beyond. Three star Tourist Board grading.